When this event came about I volunteered to take part right away! I didn’t care what day it was, I didn’t care what I had going on. 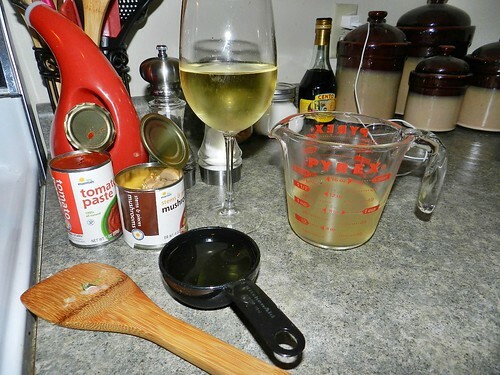 This Momma is a big fan of wine, but I have to be honest, I don’t cook with it much, only when a recipe calls for it. Well you can’t count what I drink while I’m making dinner of course! It’s been quite the learning experience. 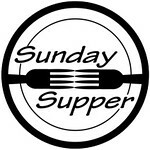 The #SundaySupper group has joined together for another amazing dinner. We have partnered up with Schlossadler Wines!! Some lucky winners even got sent some samples to cook with, even though I wasn’t chosen I knew I still wanted to be a part of this #SundaySupper. You have to take a look at their website, it’s pretty impressive. Since this was such an important even for me (hello I got married at a vineyard remember!) I really wanted to make a Pasta recipe using wine. 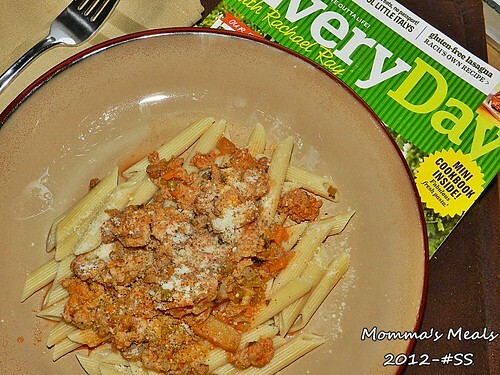 I don’t like a lot of red sauces so I found this recipe from Rachael Ray’s magazine that was for a White Ragu Sauce. Right up my ally guys!! WOW is all I have to say about this dish. Now the regular recipe called it to be made with a thicker spaghetti, however I decided to make it with Penne Rigate. Honestly, the only thing I would change about this recipe is that I would make it with the spaghetti!! Would have been easier to keep all of the yummy meat on my fork! I will be making this again because I had enough to freeze some. Yay Momma! My first step when making a dish like this is always to prepare everything that your putting into it. I chopped my onion, celery, carrot and sage and got everything ready to add when I needed it. Heat the EVOO, 2 turns of a large skillet, over high heat until smoking. 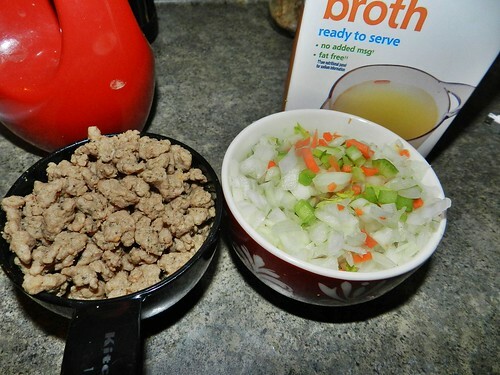 Stir in the turkey to brown slightly, then stir in the sausage, crumbling the meat. 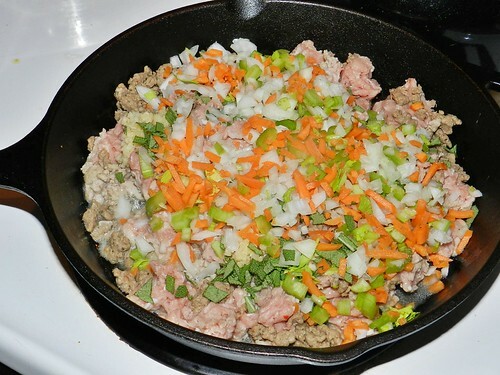 Add the carrot, celery, onion, garlic and sage; season generously with salt and pepper. 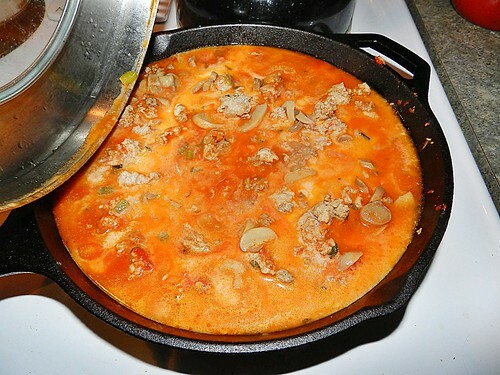 Cover and cook the vegetables, stirring occasionally, until softened, 5 minutes. This wasn’t the wine I used to cook, this is the wine I drank while cooking! Stir in the wine to deglaze, scraping up the browned bits from the bottom of the pan. Add the tomato paste and broth, stir. 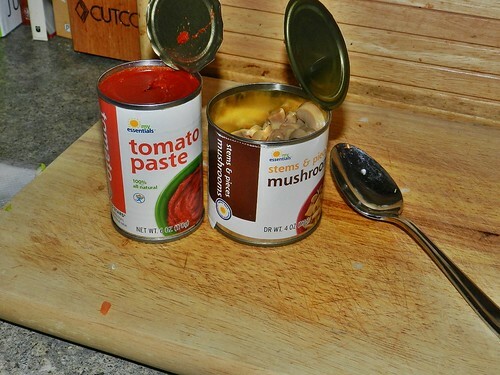 Add the pasta and toss. Top with a liberal amount of cheese. Love a good recipe that freezes well, too! I can’t wait to make stuffed shells with it!! Would love to try this! I can never pass up pasta! Happy SundaySupper! What a great recipe! 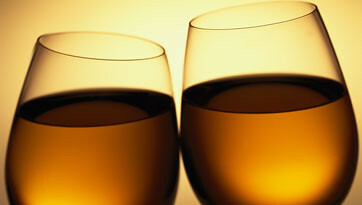 Cheers to you! Wow! That pasta is amazing! Such an interesting twist to a classic, sounds wonderful. This recipe is going to my to-do list. The idea of a white ragu is fantastic, especially with wine and mushrooms! Love it. You will not be disappointed! It had a spectacular taste, enough for seconds, even though I was full! Wasn’t it awesome!!! So glad someone can agree with me that the dish is worth making! This sounds so flavorful and delicious! It is going on my to-make list. Have a great #SundaySupper! That sauce sounds amazing! 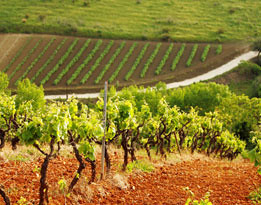 I’m with ya, I love to drink wine, but I don’t cook with it too often. My hubby hates wine, therefore, I can’t cook with it 😦 Happy #SundaySupper! Lovely ! looks so wholesome too 🙂 Heart looking sauce ! 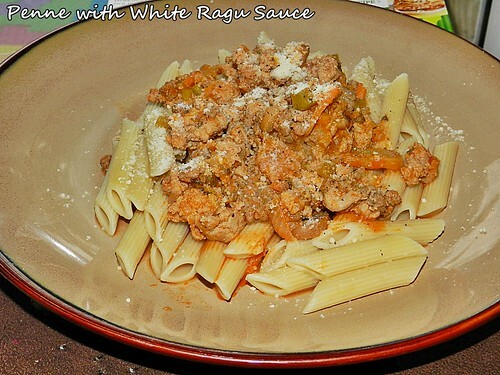 I’ve never had a white ragu sauce but it looks fabulous! I’m pinning this to try later! How creative! I’ve not heard of white ragu before, but this looks great! a white ragu sauce. never would have thought of it in a millions years! I’ll be trying that sauce very soon!